The first half of Outlander‘s first season concluded back in September and the eight episodes have been occupying DVR space for months. 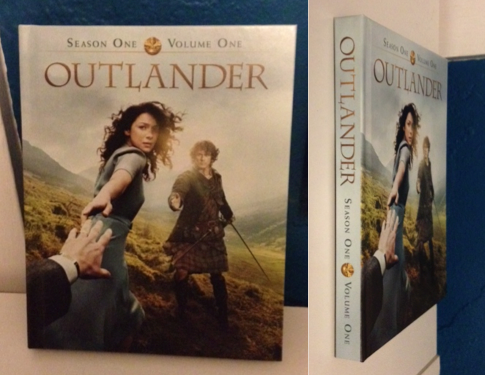 This past Tuesday (March 3rd), just one month before the show’s midseason return, Outlander Season One, Volume One hit store shelves for a mere second before fans snatched up a copy to add to their collection. Below is an overview and review of the Collector’s Edition Blu-ray set. Each special feature is summarized below, along with the cast and crew that are featured and its runtime. Short descriptions are also provided for each of the twenty one deleted scenes, as well as the episodes they come from and runtime. At the end, you will find a short review of the set and a peek inside the 32 page book included in the set. -The menus are similar on each disc, with each featuring a familiar promotional image as the back ground (below). -Each disc has four options: Play All Episodes, Episode Selections, Subtitles, and Special Features. -The Play All Episodes feature allows you to view the episodes with recaps. -Individual episode selections allows you to view the deleted scenes for that episode. 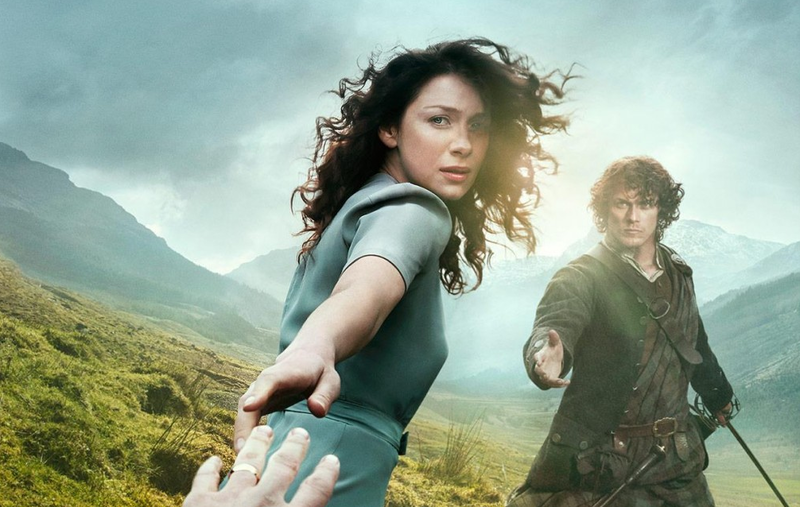 Features: Ronald D. Moore (Executive Producer), Maril Daivs (Co-Execuvtive Producer), Matthew B. Roberts (Writer/Producer), Diana Gabaldon (Outlander author), Caitriona Balfe (Claire), Sam Heugan (Jamie), and Annette Badland (Mrs. Fitsgibbons). An Epic Adventure tells the well worn tale of how Diana Gabaldon came to write Outlander, including how she found inspiration from an episode of Doctor Who. 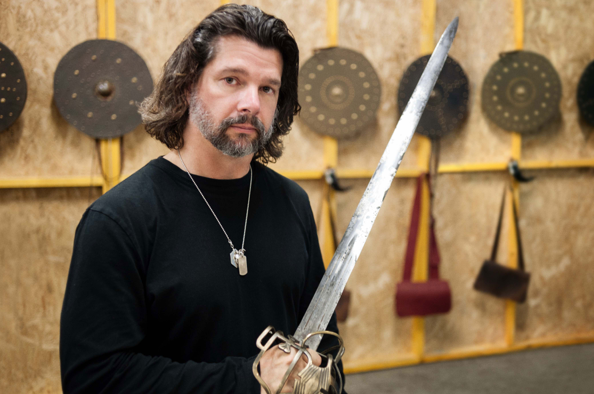 Ronald D. Moore also discusses how he became familiar with the book series through his wife, costume designer Terry Dresbach, and his producing partner, Maril Davis. According to Daivs, when they were pooling together the writing staff, they brought on writers who knew of the books beforehand and those that were unfamiliar with them to have both perspectives when approaching the project. Authentic in Design takes viewers behind the scenes of the show’s costumes. Costume designer Terry Dresbach reveals that her research started twenty years ago when she first read the books and what viewers see on screen is what she saw in her head as a reader. The feature also includes a behind the scenes look at the costuming workroom, where they attempt to assemble the costumes as closely as they can to how they would have been made in the past. The feature also touches on the four tartans seen on the show, including the basic Outlander and generic tartans, as well as the ones for the MacKenzies and Frasers. The third feature on the disc delves into the casting process for the film, including the ease in which they cast Jamie and the difficulty in finding the right actress for Claire. Both Ronald D. Moore and Diana Gabaldon express the excitement in finding Sam Heughan for Jamie, who the writers refer to as the “King of Men.” Caitriona Balfe also touches on her audition process and Maril Davis reveals one of the scenes used for finding Claire was the “Stop! Help! He’s going over” scene. Producer David Brown discusses casting Tobias Menzies and his ability to make it seems like two actors are portraying Frank and Black Jack Randall. On Location takes a look at how Scotland itself is a character in the show and its inspiring presence for the actors. In the feature, Moore focuses on Castle Doune, which stands in for Castle Leoch on the show. While the exterior needed no enhancements during the 18th century scenes, the location was digitally altered to make it a ruin when Claire and Frank visit the site in the 1940’s. The castle’s interiors were built on a set, but many were based on the actual interiors of Castle Doune (the production actually took molds of the actual walls in Doune to replicate on set). Emerging a Scot focuses on the three weeks of boot camp the cast when through upon their arrival to Scotland. A lot of the training focused on fighting, weapons, and riding horses, but it also included learning Gaelic for the series. Moore describes the fighting style as more brawl-like, while Grant O’Rourke calls it an “ear biting” and “bullock kicking” good time. The second portion of the feature moves away from the horses and brawls to give the audience a little insight into the cast’s Gaelic lessons. The feature contains some footage of Sam Heughan and Gary Lewis’ lessons with Àdhamh Ó Broin. Ó Broin reveals that he started teaching the cast the numbers one through ten to acclimate them to the sounds of the language, some of which cannot be found in English. As their tutor, it was his goal to make it sound authentic and like it is their first language. -Gaelic classroom with Àdhamh Ó Broin- The cast spent 3-4 hours a week with him during bootcamp. -Full armory- Weapons are constructed specifically for the show and are aged to fit the period. The set contains twenty one deleted scenes between the two discs. The deleted scenes are features with the episode they are from and are shown within the context of the episode. Many are also extended versions of scenes that appear in the broadcast versions of the episodes. Mrs. Graham tells Claire and Frank a local ghost story as she leads them to their lodgings. Claire encounters Captain Randall and tries to fight off his attack. Mrs. Fitzgibbons outfits Claire in proper period attire. Murtagh walks Claire through the castle to meet with Colum MacKenzie. 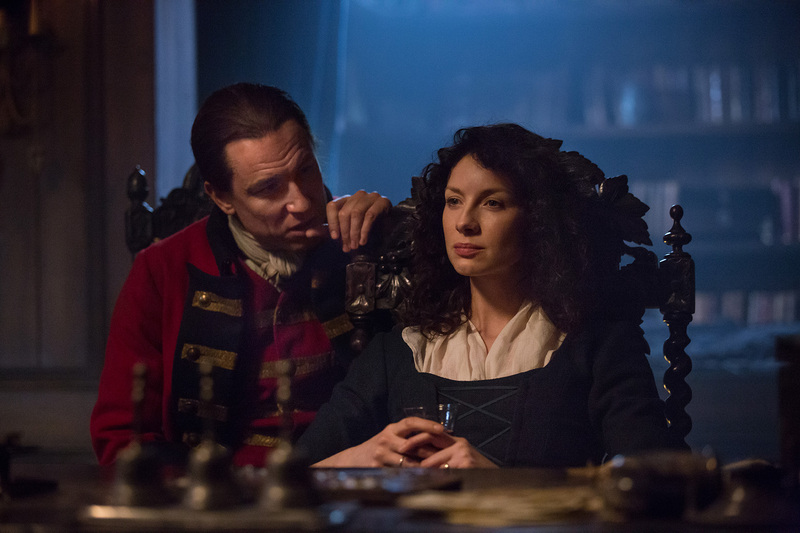 During their meeting, Claire recounts her journey and encounter with Captain Randall. 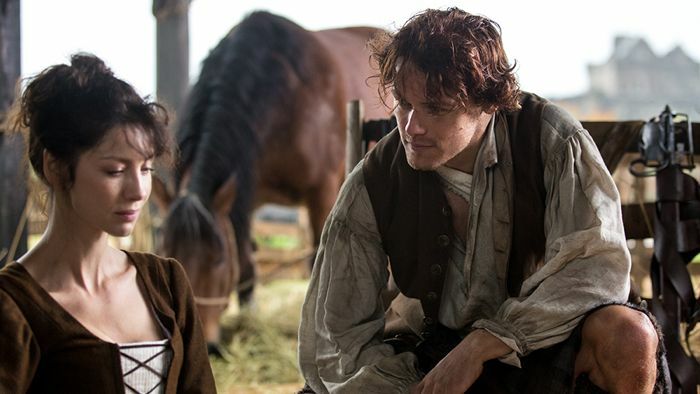 Claire and Jamie talk in the stables. Rupert tells Claire she could be worse off with Angus to be the one following her. Claire describes her daily routines that keep her occupied as she waits to leave Leoch and flashes back to her visit there with Frank. Colum hears cases from his people and passes judgement on their situations. Claire and Mrs. Fitzgibbons tend to Jamie after he takes Laoghaire’s punishment. Claire admires Geillis’ attic and medical stock. Jamies pledges his obedience to Colum (and compliments the whiskey). Claire and Jamie discuss Dougal using him for his own agenda. Claire and Dougal rise off with English soldiers after they question her association with the MacKenzies. Claire recounts a fabricated story to Captain Randall about how she came to be in Scotland. Claire works through the benefits of marrying Jamie given her current situation. The scene also contains a flashback to a conversation between Claire and Frank on a dock after the war. Murtagh questions Dougal’s reasons behind wanting Jamie to be the one to marry Claire. Jamie recounts stories about his parents to Claire. The men taunt Jamie and Claire on their wedding night. 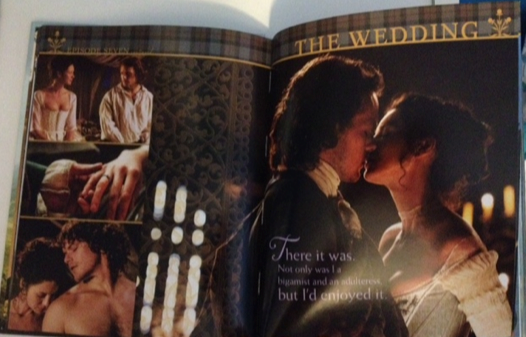 Jamie and Claire’s wedding ceremony in its entirety. Jamie explains the blood vow portion of the ceremony, which is also featured in the scene. Claire and Captain Randall discuss powdered wigs and the rules of society. 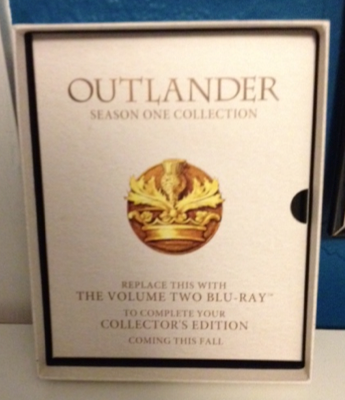 While many fans will be disappointed at the prospect of having to buy two sets to complete their Outlander season one collection, it is reassuring to see that Starz and Sony have not skimped on the special features for Volume One. Although some features contain well known and often repeated information (how many times can we hear about Ronald D. Moore’s dinner or Diana Gabaldon finding inspiration from Doctor Who? ), others provide new behind the scenes footage, as well as the opportunity to hear from less familiar members of the Outlander team. 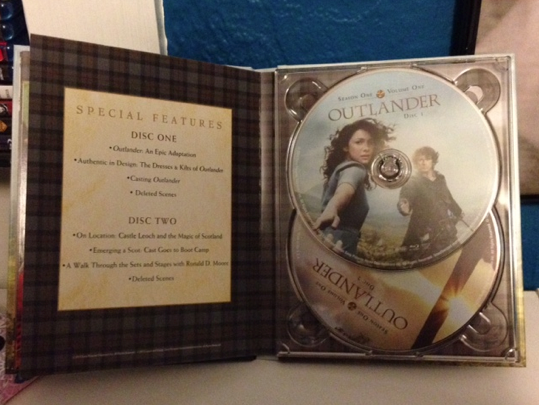 The only thing lacking in the special features department is a behind the scenes look at the music of Outlander. Hopefully something on this topic will make the cut in the next set. There is no shortage of deleted scenes on the discs, which will no doubt thrill fans who cannot get enough of the series. It is nice to see the scenes within the context of their respective episodes, a helpful feature for those of us who have not seen some of the episodes in months. Although the deleted scenes are great in number, there are a few that play out more like extended scenes, adding just a bit more to what made the episode’s final cut. There are a few extras for this Blu-ray set, including the collectable lenticular and 32 page book attached to the case. 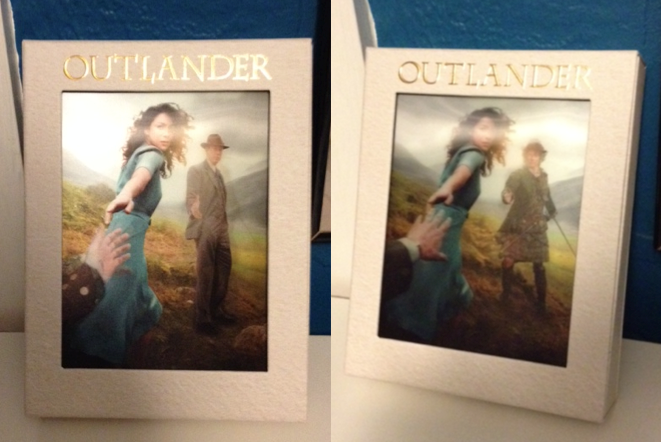 The lenticular can serve as a cover image for the box set, but is also easily removable if one wishes to display it in another setting. 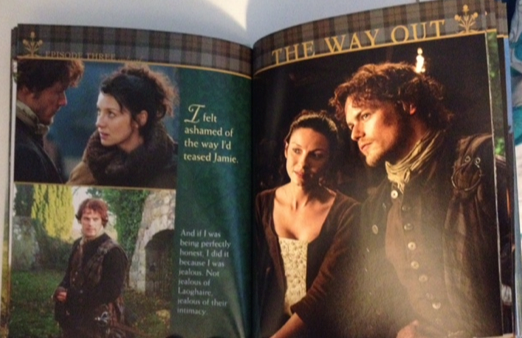 The book’s images are plentiful and grouped by episode. Many are official stills that were released in previous months, but it is nice to see them collected here. Although, it does make one long for a behind the scenes book once the season ends. If I do have one gripe about the set, it is the packaging. While it gets points for aesthetics, I am someone who favors simpler cases in an effort to maximizing shelf space and ease of access. The content of the Collector’s Edition set is plentiful enough to not be dismissed simply because it is only the first volume of a set. One can safely assume there will be a volume two when the season concludes later this year (as there is a placeholder for it), but there is no word yet on whether or not there will eventually be a set with all sixteen episodes together. Some fans may be strong enough to wait and take that chance, but for those that need their Outlander fix, this set does not disappoint. 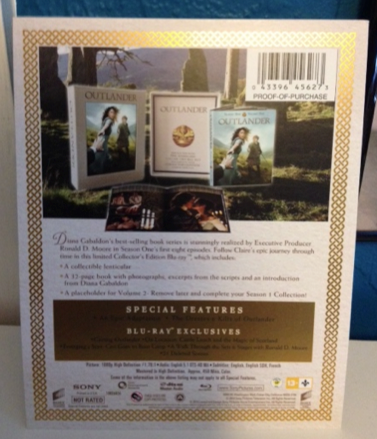 Outlander Season One, Volume One is also available on DVD and as a regular Blu-ray set. The show returns April 4th on Starz. This entry was posted in DVD/Blu-ray and tagged Adhamh O Broin, Blu-ray, Caitriona Balfe, Collector's Edition, Diana Gabaldon, Duncan Lacroix, Gary Lewis, Graham McTavish, Grant O'Rourke, Lotte Verbeek, Maril Davis, Review, Ronald D. Moore, Sam Heughan, Starz, Stephen Walters, Terry Dresbach, Tobias Menzies by Stephanie Bertone. Bookmark the permalink.